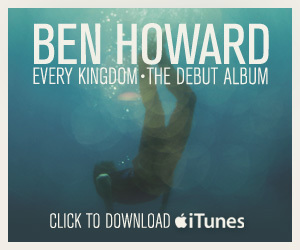 Following on from our previous article (albeit a few months ago), I thought I’d like to mention that Ben Howard’s debut album, “Every Kingdom” is released on the 9th October 2011. It has already produced the singles “The Wolves” and “Keep Your Head Up”, and will no doubt produce more singles in the coming months! I saw him live a couple of months ago and I haven’t honestly seen that kind of atmosphere or energy at a gig since a young ginger, dread-locked guy called Newton Faulkner rocked up on the scene a few years ago, and anyone that knows me know that if I hold someone in the same regard as him then they’ve got to be good.